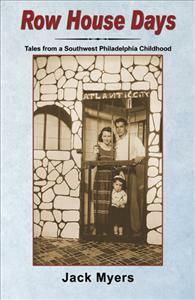 Jack Myers’ fictionalized memoir explores the dynamics of being raised in a declining Southwest Philadelphia neighborhood. Pint-sized and four-eyed, little Jimmy Morris is near the bottom of the food chain in his working class “streetcar suburb” of Kings Cross. He’s a dreamer, schemer, schoolyard scrapper, secret lover of books, and classroom clown . . . a kid you can’t decide whether to hug or to slap. Meanwhile, the conformity of the 1950s is yielding to those turbulent ’60s. Yes, the times they definitely were a changin’ — with Kings Cross in the eye of the societal storm. America’s answer to Angela's Ashes. I have not read 2 books in 20 years, but this book brought me back to my days growing as a child, Iam from 56th myself and I thought I was back there even if it was only for the 2 days it took me to read the book. I would like to know when the 2nd book is going to be done. I received the book from a friend. I peaked at the short photo album. They sure brought back many memories. It was a had to read. I like the way the author segmented the book by memorable events. I could not put the book down until finished. I found myself in Jimmy Morris's shoes (Jack Morris) the whole way through his journey on the streets of Southwest Philly. I spent much of my childhood in Dobbs Creek (Cobbs Creek), Mt Lebanon Cemetery (Mt. Moriah)doing the things that only kids of yesterday could remember. Southwest Philly was more than row houses, narrow streets and steamy hot summer days. It was a place in time where people interacted with people and solved issues among themselves without "my" lawyer and "your" lawyer. Box,wall,half,step ball was the way kids interacted with kids. The streets of Southwest philly illustrated that kids could organize and choose among themselves in picking teams and living without adult direction. There was always the good, bad and the ugly in all of us who were there on the asphalt streets and parks. Computers, credit cards and close supervision of today makes this a refreshing departure,if only in a memory. Southwest philly in the 60's was how common people where able to have exceptional times and memories without the clutter and so called sophistication of today. A must read for everyone who lived the rowhouse days! Great job Jimmy Morris (Jack Myers)! Hello, born and raised-and a last Mohican at 62nd Reedland. A lot of good people and things came from our neighborhood. There is much to be proud of.It was a wonderful place to grow up and I am only 40 years old . NO matter where I go and what I do, am a Clincal Pharmacist for a very large pharmaceutical company, I take with me the love and pride of having grown up in one of the most beautiful,historic, places with the greatest neighbors. Their memory will never be gone as long as we remember them. Long live Southwest Philly.